Nowadays, custom printed t-shirts are cheap enough to buy for almost any occasion. They might not be the most suitable apparel for events like weddings and baby showers, but they are great for those less formal occasions where you aren’t forced to wear suits, dresses, ties and the like. For your family reunion there is no need to rely on boring formal wear, and you can do much, much better than just going casual. 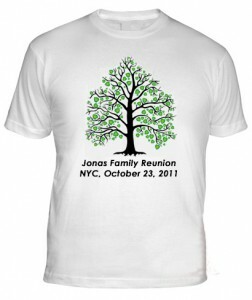 Why not make things fun and interesting with your own custom printed family reunion t-shirts? Family reunion t-shirts are great because they bring a sense of unity to the occasion, and are very useful for such things as helping family members to identify each other. Now, while it’s still warm out is the perfect season for t shirt screen printing, so take advantage of that! When it comes to having custom t-shirts printed for a family reunion, you have two main options: to go with a conventional design, or to do something a little more creative. A conventional design would usually include the family name, the reunion date and the place, for example “Smith Family Reunion, Oct 1, 2013, Columbus, OH” and a picture of a tree. Conventional designs are a very popular option, and especially popular for larger families that are meeting for the first time in a long while. In terms of creative designs there is practically no limit to what you can do. Slogans like “It’s a family thing” or “Our roots run deep” are no-brainers. Going with the style, logos and fonts of a much-loved film or TV show is always a popular option, for example, putting F.A.M.I.L.Y in place of the Friends logo, or using the distinctive logo from The Godfather. You don’t want to be the only one at your family reunion wearing a custom printed t-shirt. Your relatives might be grateful, but you might look a little silly on your own. This is why you should plan and coordinate with other family members well before the event takes place. Here the t-shirts can be as consistent or as variable as you like, but just like family, it is always best to have something in common between the shirts. Every family member could wear a tee with the same color, design, font, slogan etc., or the same design could be used but with different colors for men and women. Younger and older members of the family could have their own slogans…there are so many different possibilities. Once everything is agreed upon, it’s always best to nominate one person to collect the funds, and buy them all in bulk for best pricing. It always helps to have someone in the family who is willing to donate their own money, buy all the shirts and give them to all family members as gifts, but that’s rarely the case. More than likely, everyone chips in. Having one person in charge then becomes a necessity. This makes it more convenient and ensures that everyone has their tees for the occasion. Our standard turnaround for printing custom family reunion t-shirts is two weeks, though if your reunion is fast-approaching we do offer rush turnaround times. Most importantly, whatever custom t-shirt design you have in mind for your family reunion, remember to keep it consistent as a whole, being that’s what it’s all about…connection. Have fun!